Oscar Rabin was born in Moscow in 1928 to a family of physicians and started to draw in early childhood. During the war (1942 - 1944) he studied at the art studio at the House of Young Pioneers where his teacher was Yevgeny Kropivnitsky, whom Rabin spent much time with. At the end of the war, after liberation of Latvia by the Soviet Army, Rabin went to visit his relatives in Riga and joined the Latvian Academy of Fine Arts. However, after the Victory in 1945 he returned to Moscow and continued to interact with Yevgeny Kropivnitsky. That same year, he entered the second year course of the Surikov Institute, but feeling nostalgic for the Latvian Academy of Fine Arts, returned there for some time before coming back to Moscow for good in the autumn of 1947. In 1950 Rabin married Valentina Kropivnitskaya, and in 1951 the family moved to Lianozovo in the environs of Moscow. In 1957, Rabin participated in the exhibit of young artists during the 6th World Festival of Youth and Students in Moscow. Thanks to the Honorary Diploma awarded to him at the Festival, Rabin was in 1958 hired by the Applied Art Enterprise where Nikolai Vechtomov, Vladimir Nemukhin and Lev Kropivnitsky had already been working. Oscar Rabin initiated and organized exhibits of non-conformist artists in the spring of 1974 at an empty lot in Belyayevo, the so called “bulldozer exhibition” which ended up in a crackdown and arrest of its participants, including himself. Shortly after this exhibit, the Moscow Municipal Council allowed Rabin to hold an exhibit in Izmaylovo. In 1978, Rabin left with his family for France and had intended to return, but was deprived of Soviet citizenship by decree of the Presidium of the Supreme Council of the USSR during this journey. Since then, he has been living in Paris and was granted French citizenship in 1985, although the Supreme Council of the USSR reinstated him as a Soviet citizen in 1990. 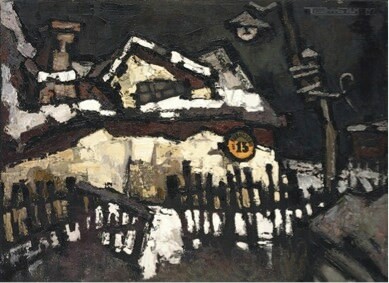 Rabin’s artistic style was formed as far back as the 1950s, when studio landscapes, portraits and flower-pieces gave way to the real world around the painter. His works are laconic and uncommonly rich in emotion. One of his main methods is chronological division of the oeuvre using such elements as photographs, newspaper clippings and combination of several chronology dimensions, distorted perspective, deformation principles, and altered proportions. 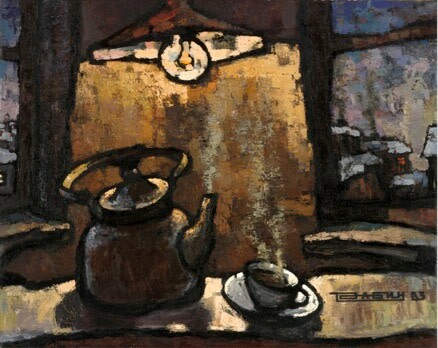 Using every-day symbols of various cultures including Soviet and Western, the artist affirms the interaction thereof. During his emigration, personal exhibits of Rabin received world-wide acclaim and have been held in France, Great Britain, Austria, Switzerland, the USA and many others. Many famous collectors worldwide take pride in owning his works.